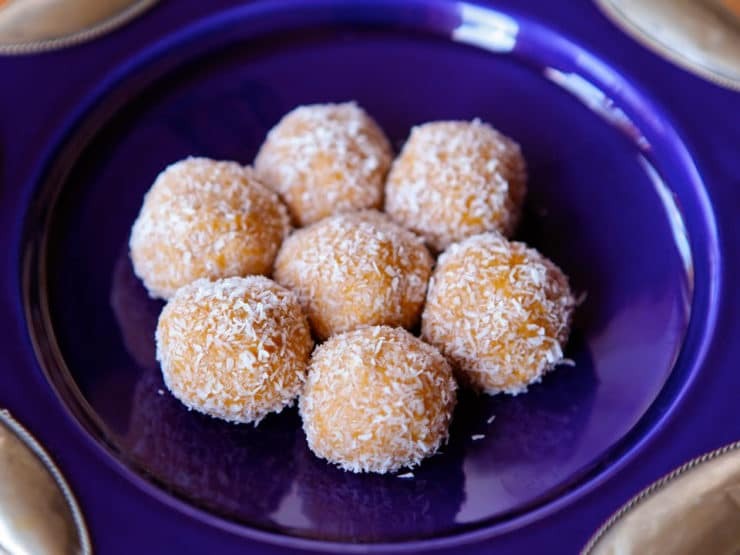 I wanted to share a quick, easy treat before the weekend, and these Peanut Butter Honey Truffles seemed like the perfect choice. I make a batch of these little snacks every so often and keep them in the fridge. I learned to make them back in elementary school at a summer day camp. Once a week, between tie die and ceramics class, they would teach us a new recipe. We made easy things like granola and trail mix. Of all the recipes we learned, I liked these truffles the best. They’re made from simple, natural, unprocessed ingredients– peanut butter, oats, honey, and coconut. What could be bad? Back in camp we made the truffles with whole oats, but over the years I’ve discovered that I like them better when I blend the oats to a powder. They’re perfect for when I need a little protein pick-me-up. The honey satisfies my sweet tooth, and the peanut butter satiates my hunger. They’re very filling; a couple of truffles totally tide me over between meals. They’re also gluten free if you use GF certified oats. They’re really easy to make and you can get the kids involved– they’ll have fun rolling the truffles with you. It’s simple, unprocessed snack food you can feel good about. Shabbat shalom! 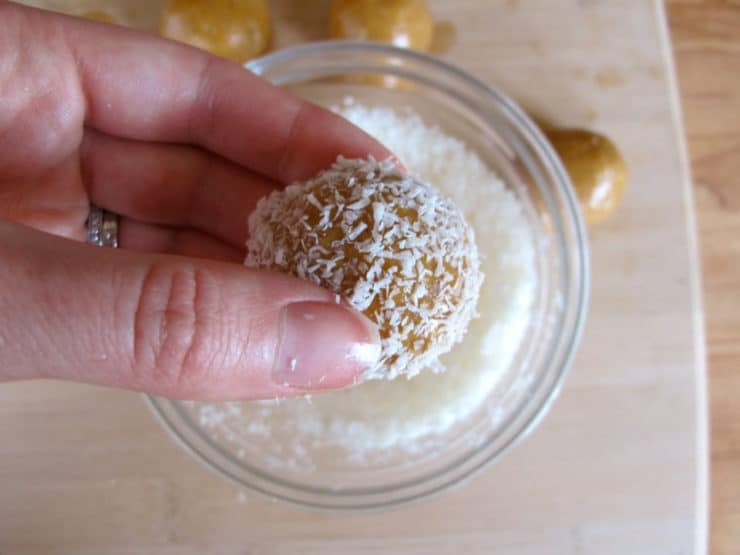 Peanut Butter Honey Truffles with Coconut - a simple, unprocessed, healthy snack for a burst of sweet protein between meals. Kosher, pareve. 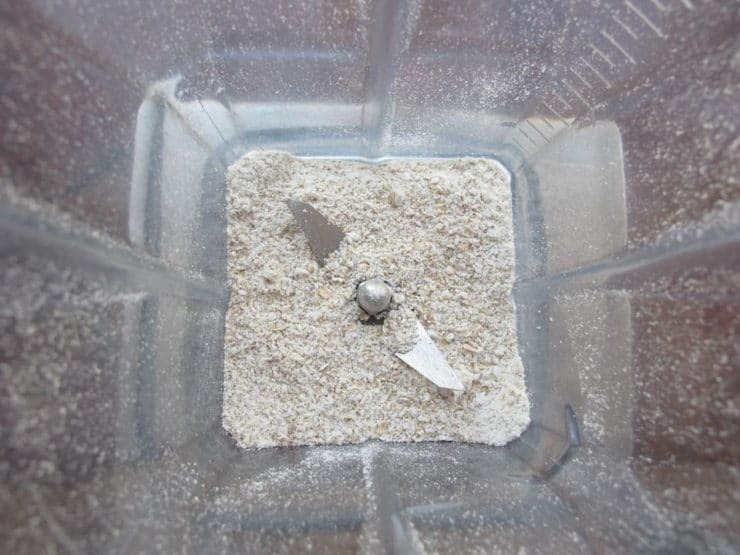 Pulse the oats in a blender for 30-45 seconds till they become a powdery flour. 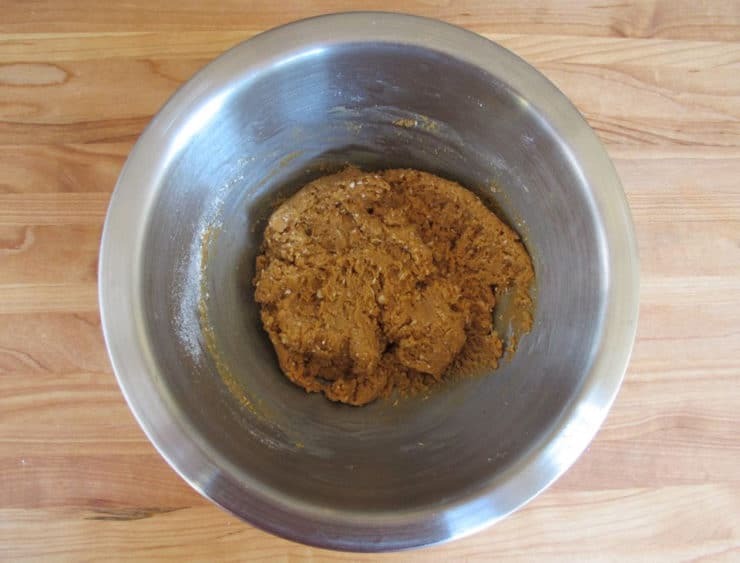 In a mixing bowl, stir together peanut butter, honey, vanilla, salt and oat flour. 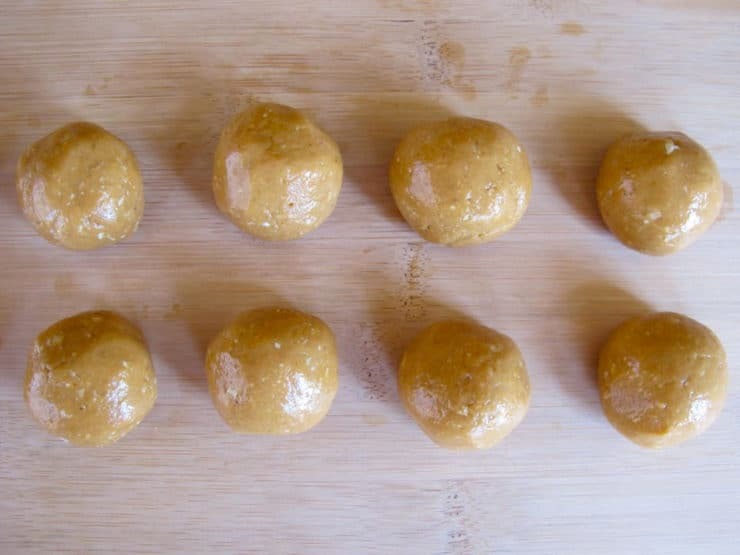 Roll the peanut butter mixture into 1-inch balls. Roll each ball in dried coconut to coat. Place truffles in the refrigerator. Chill for at least 30 minutes. Serve cold. Store truffles in the refrigerator. I am wondering if these can be made ahead of time and frozen and saved for a big event? Or if refrigerated, how long begore the event wii they stull be good? Thanks. can you replace the oats with regular flour? I’ve never tried that, so I’m not sure. I really like the texture of the oats, flour might make it a bit boring… but if you decide to try it please let us know how it goes! I learned the same recipe while at the YMCA in middle school summer camps. I’ve made a few varieties over the years: powdered sugar in addition to honey if you have a really sweet tooth; about 4oz of cream cheese & 4 oz of PB for a creamier truffle; could also add protein powder mix, for an on-the-trail snack. Could add 8oz of PB with pulsed Oreos, too. Tori, these sound fantastic! I just saved the recipe – I am going to make them for my Name Day on the 7th of December… I can’t wait! 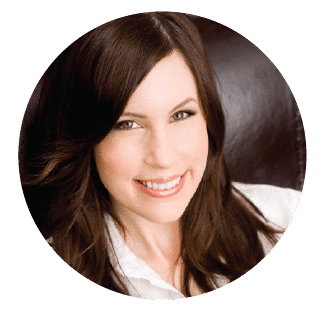 I would love Marianne’s chocolate truffle recipe. My daughter made these and she LOVES them!!! Hi Kathleen, I can’t take credit for this. It was on the back of the Eagle Brand sweetened condensed milk can. I went to their website to get the recipe. MELT chocolate chips with sweetened condensed milk in large saucepan over low heat. Remove from heat; stir in vanilla. POUR into medium bowl. Cover and chill 2 to 3 hours or until firm. SHAPE into 1-inch balls; roll in desired coating and/or decorate with frosting and candies. Chill 1 hour or until firm. I did not decorate with frosting but used cocoa, coconut, chopped nuts for the coating. Everyone loved them!! So delicious and so easy! Great treat for the kids and me! Hi! I’ve been subscribed to your emails for a while. I have been searching for a good recipe to use up some natural almond butter – normally I follow recipes exactly, but I couldn’t pass up this opportunity! 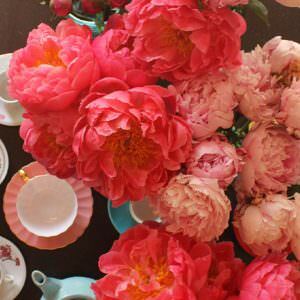 – and this recipe is perfect!! I did have to refrigerate the mix before rolling, I was afraid that adding more ground oats would result in the treats being too hard once they were fully refrigerated. I used the full amount of honey, they taste great and I will be trying this recipe with peanut butter. Thanks!! Terrific! Thanks for reporting back Carolyn. Hello, I have not seen peanut butter powder in Australia. I like the sound of it as I am a big fan of all things peanut. What else can you do with it besides smoothies? Flashback- Wow! I used make these with rice krispies as a kid. It was the only “baking” I was allowed to do when I was babysitting my brother, prior my parents came home from work. Delicious! Not being a huge fan if shredded coconut. I subsituted with ground almonds. I rolled half of them in the coconut before I noticed they did not look the same as the picture at all, the coconut was being pushed into the balls despite soft handling. I refrigerated them and then rolled the other half. Worked out great ! Great tip Shane! Not every peanut butter has the same consistency, so if your peanut butter is softer/more liquid, you may need to refrigerate before the roll. 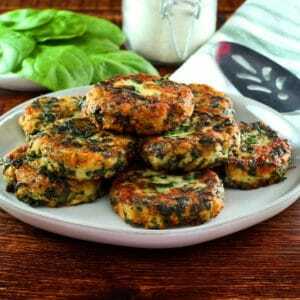 You can also add a little more oat flour to firm things up. Thanks for sharing! I just made these with a few modifications. I used a little maple syrup with the honey – cause I made a double batch and didn’t want to use all my honey. I added three tablespoons of cocoa and used crunchy peanut butter. Hubby loved it!! Now to roll into balls and surprise him at work for sweetest day! Thanks Tori for the recipe!! I still love peanut butter and honey on my toast, so I always have these ingredients on hand. Ya gotta know that I’m making these. Enjoy your blog, enjoy your recipes…will be making these with my daisy scouts – thanks for posting! Maryanne, make sure when the daisy scouts are making them they don’t lick their fingers in between rolling the truffles and coating them. I did the same thing with my daisy scouts but made chocolate truffles. They loved the rolling and coating and licking their fingers at the end. If you don’t mind making it more dessert-y and less snack-y, cocoa nibs would be delish! Cocoa powder would be okay in the mix, but might be too overpowering for the rolling/dusting. If you mix it in, I think it would be great. It’s a fun concept to play with, there are endless variations. Enjoy! Malka, I used to make the same kind of recipe with sesame seeds instead of the coconut. Try it! Is there any substitutions for the coconut? I don’t really like it. That is definitely going on the list. You’re a genius.